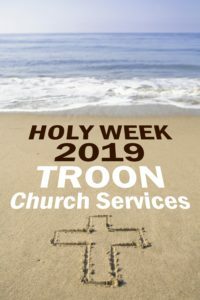 Troon Holy Week church services are for our whole community and shared by the various churches in Troon. There are also additional services and vigils organised by individual congregations. Everyone – whatever your background – is welcome to attend every service. If you haven’t been before, please join us as we journey together through the transforming events at the heart of our Christian faith. This year the services are joined by Eastertainment, a new event to celebrate Easter, God’s love for us and our community, supported by Troon Community Council, Messy Church and Troon Churches Together. Leading up to Easter there will be a series of ecumenical Holy Week services, every weekday evening, this year held in Our Lady of the Assumption and St Meddan Roman Catholic Church (except Thursday, see below). Services start at 7:30 pm and will be led by Rev Canon Archie Brown. Each evening the preacher will be from a different church in Troon. 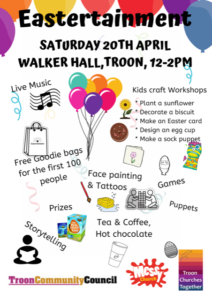 Eastertainment is an event to celebrate God’s love for us and our community, supported by Troon Community Council, Messy Church and Troon Churches Together. See the adjacent poster or the Eastertainment Facebook page for details. Workshop places can be booked on Eventbrite. Wrap up warmly and enjoy this uplifting joint open air service of worship. Hot filled rolls for breakfast will follow in St Ninian’s Scottish Episcopal Church halls. All other church services in Troon will follow at their usual times.